Easy to make and they are the freezer kind, but of course are called refrigerator cookies. Shouldn’t they be called Freezer Cookies? Go figure?!!!! So, once you make the dough (in your processor or if you prefer, in a bowl with your electric mixer) you roll the dough into two logs and freeze them for at least 2 hours or up to one month. One roll makes at least 30 delights so I bet you’ll easily have some cookie dough left over to make into yummy cookies some time later unless you are baking for a large crowd. Below, look for variation possibilities. In a food processor, pulse the flour, confectioners’ sugar, salt and lemon zest until combined. Add the butter pieces and process till crumbly. Add the egg yolks and lemon juice. 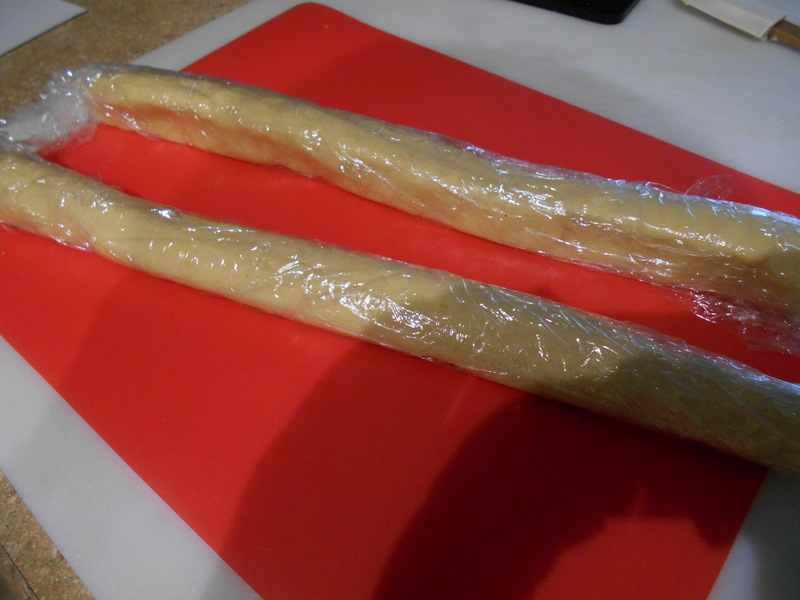 Divide the dough in half and form with your hands each half into a 1 ½ inch wide log. Wrap in plastic wrap and freeze until firm—- 2 hours or up to 1 month. Place parchment paper on your baking sheet(s). Spread granulated sugar on a paper towel and roll the log(s) in the sugar. If you still want more sugar on the log, use your hands to place more on the log. With a sharp knife, slice the log(s) into 1/4 inch thick slices and arrange them about 1 inch apart on the baking sheets. These cookies really don’t spread so you are safe from their melding together. Bake until the cookies are golden brown around the edges (about 15 minutes). They’ll be sort of white on the tops but as long as they have some brown edging, they’ll be perfect. If you are using more than one baking sheet, rotate them half way through the baking cycle. Transfer the baked cookies to a wire rack or onto paper towels to cool. To store, cover and keep at room temp for up to 5 days. They also freeze well. Hint: want orange flavored cookies? Use orange juice and orange zest. How about lavender buds, crystallized ginger, ground almond, ground pecans? Use your imagination to alter these cookies to your very own taste and make sure to comment on what you have invented. I can’t wait to hear. No measuring is daring and it can be fun. It’s certainly the quick way to cook and you might be surprised at how well you can do this. Crepes are a good substitute for morning pancakes and they certainly are good for lunch, dinner or dessert. They are so versatile. So, it’s up to you with what you want to fill or top them: ricotta cheese and berries? Jam? Veggies and cheese? Chicken bits with a lovely sauce over it all? Or topped with a delicate orange or lemon Crepe Suzette sauce? Variations are endless and fun to invent. You can even have an array of fillings on the side and let guests or your family invent themselves. 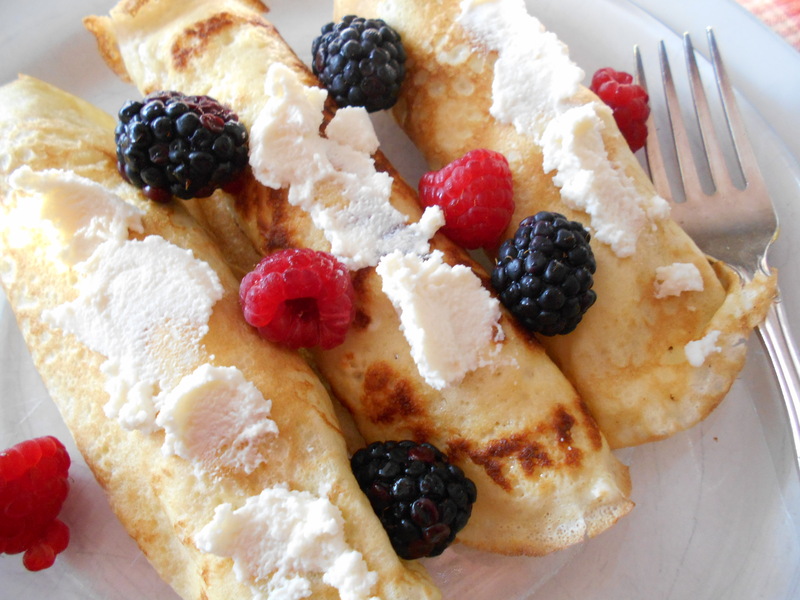 What I myself had this morning were crepes filled and topped with ricotta and fresh berries. Yum, they were delicious! I could go on and on about fillings and toppings but what I am giving you here is just the basic crepe recipe. The trick with this recipe is to use the SAME SIZED cup or glass for placing the eggs, flour, milk and butter because you are going to eyeball your amounts within these four vessels. A vessel that holds about 2 cups (oops—I shouldn’t have said that—sorry) will make enough crepes for 4. My picture showing my vessels with the ingredients are for half of the listed ingredients i.e. 1/2 a vessel of eggs, 1/2 vessel flour, slightly less than 1 vessel full of milk & 1/8th vessel of melted butter. I use a Teflon crepe pan but if you don’t have one, then make sure to put a little oil or butter in your pan first. I like to make sure my pan is quite hot (when an entered droplet of water sizzles). If your first crepe doesn’t turn out quite right, fear not because you’ll know whether to turn the heat up or down to make the next one right. To keep your crepes warm, you can have a double boiler top all ready to put them in; or wrap them in foil or in a dish covered with foil in a 200F or 250F oven. 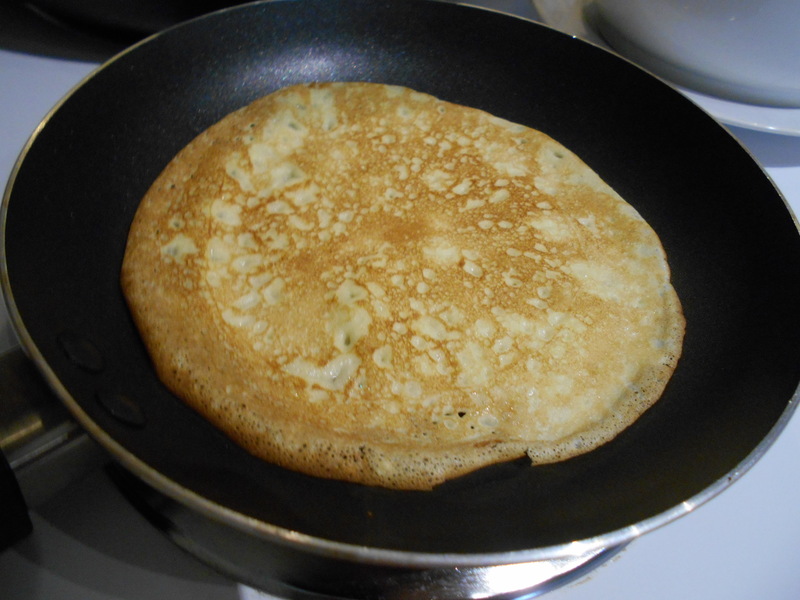 I also have had left over batter which when whisked again make fine crepes the next day. You also can freeze left-over already made crepes. So see how versatile these guys are? 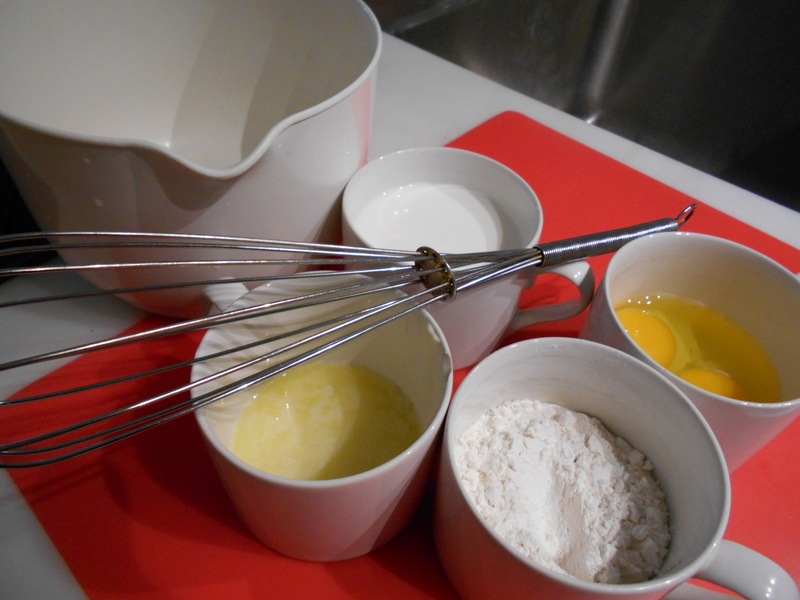 In a bowl that has a pouring spout is the best, whisk well or beat with electric beaters the eggs. Add the remainder of the ingredients. Whisk or beat till you have a smooth batter. Heat your crepe pan or a small size skillet. Add a bit of the batter, just enough to partially cover the bottom because then you want to roll your pan around so the batter slides smoothly over the whole pan bottom. You don’t want a thick crepe. You want a crepe that is fairly thin. Cook until the edges begin to brown—anywhere from 30 seconds to 1 minute. Flip over with a spatula and cook for another 30 seconds or more. You can peek to say how brown the bottom of the crepe is getting. Pile them up on your oven warmed platter and cover; or place in the top of your double boiler that is warm by boiling some water in the bottom part. 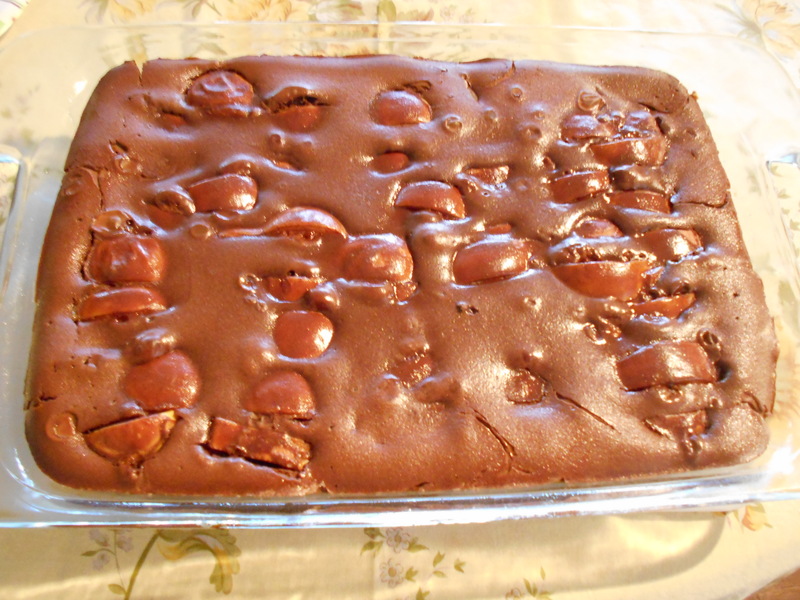 Easy to whip up and yummy to eat, this will certainly be a treat for you and your honey. 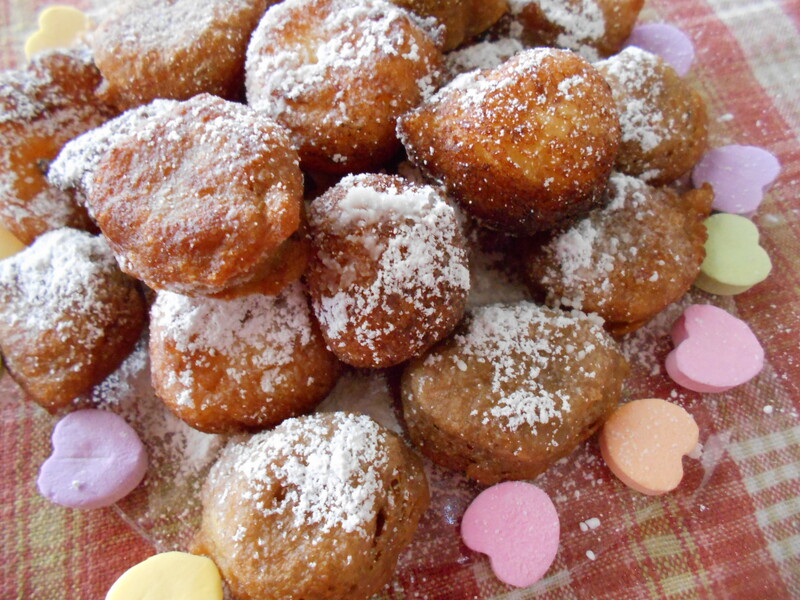 Celebrate Valentine’s here in the good ole’ US of A with an Italian twist (Baci Di Ricotta). This recipe can make about 30-40 kisses and goes very well with coffee, espresso or even a nice liqueur. 1/2 Tsp. vanilla extract –but this can vary like almond, rum, liquorish, etc. Use your imagination. 1/2 Tsp. ground cinnamon but again you can vary like nutmeg, etc. In a medium bowl and with a whisk (or you can use your electric beater) beat the egg and then add the ricotta and extract. When the liquid mixture is blended till smooth sift in the dry ingredients and mix again so that you have a smooth batter. Next is the slightly tricky part, but fear not, you can do it. Pour the canola oil in a large skillet so that there is about 3/4 inch of oil in it and heat oil over medium heat till the oil is about 350F degrees if you have a candy thermometer, or when you drop a small piece of bread in the oil, the bread will be browned in 40 seconds or so. At this point, test one kiss to see that it does not brown too fast and too much. If it does, turn the heat down, wait a minute and try another kiss. You want your oil to be just perfect heat wise. Visually, your kisses should puff and turn golden brown on one side after about one minute—and then when you turn it over with a slotted spoon, it should brown in another minute. Place about 5 or 6 kisses at one time in your pan so that you are not overwhelmed. When your kisses are browned nicely, place them on a paper toweled lined platter to drain. Let them rest for several minutes; pile them on a pretty platter in a rough pyramid and sprinkle, through a fine-meshed sieve, some confectioner’s sugar over them. Happy Valentine’s and Buon Appetito. These kisses are best devoured immediately; however you can pop them, PRE-SUGARED, on a wire rack over a cookie sheet in a 300F oven and keep them warm for up to 1 hour. As well, I have stored left-over’s in my refrigerator in a closed container and then the next day reheated them on some foil in a 300F oven for about 10 minutes and they certainly still tasted good; not as good as when first cooked but good enough. So, don’t throw those left-over’s away—that is if you have any. 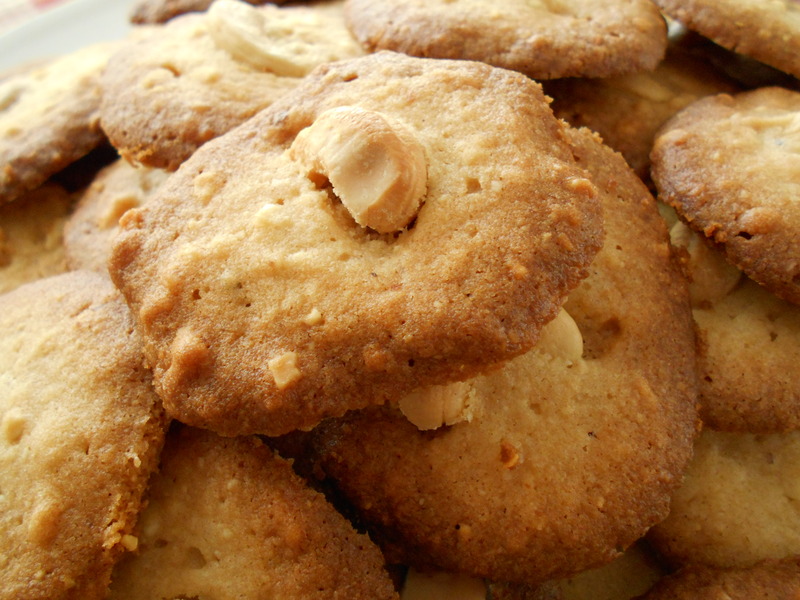 Nut Delight Cookies (makes 3-4 dozen cookies) Extra Delicious and Easy. The holidays are almost upon us and before you know it, they’ll be over and gone. However, even so it’s never too late for a fast and easy cookie making. Why? Well, here are 3 reasons for the baking of this particular lacy and delicate treat. They are versatile as to the ingredients and therefore I bet that you have them all in your pantry/refrigerator—so no shopping. They are perfect to take for your cross country ski outing on our BCRD (Blaine County Recreation District) trails now that they and the weather are getting rather perfect. Nut halves and larger pieces for last minute before baking décor. Line your cookie sheets with parchment paper if you have that; if not, try to use a Teflon sheet and if you don’t have that, lightly grease your sheet. Cream the butter with the sugar in a medium sized bowl. When the batter is nice and smooth mix in the egg yolk till well combined. I used my electric beaters to do all of the aforementioned and then, you will be using something like a rubber spatula or wooden spoon to add in the well chopped nuts. Stir again till well combined. In a separate bowl, sift and flour and salt or put the flour and salt in a sifter and add the dry ingredients to your creamed butter concoction; mix till well combined. The dough will not be really thick and that’s OK because you are going to drop medium size spoonfuls onto your lined cookie sheets— 3 horizontally and 3 inches apart because they do tend to spread and onward down on whatever size sheet that you are using. When your sheet has the spoonfuls of dough on it, place a half nut or some smaller slices of nuts into the top of each spoonful. Bake for 12-15 minutes; if using two cookie sheets, rotate them half way through. You want to watch carefully at the 12 minute point to see that they don’t get too brown. Let them rest for a minute or so on the cookie sheet and then place the cookies on a rack to cool. Store in an airtight container if need be—however, I bet they’ll all be gone before you have a chance to do that. Above on your left is the tart decorated for Lois A. 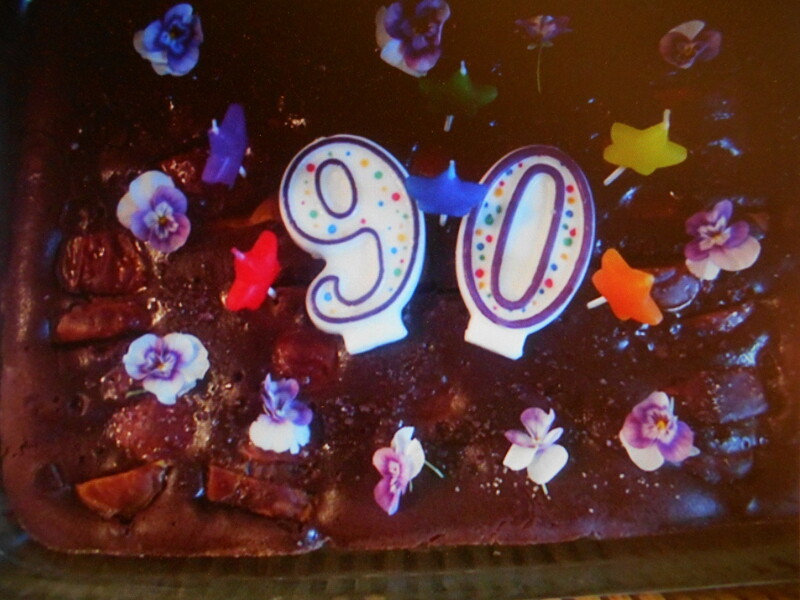 90th B-D. Besides the bought decorations I used some violets from my garden. The middle picture shows the crust, pierced and ready to go in the oven briefly. The right picture shows the tart undecorated. This is truly DELICIOUS. It’s hard to stop eating it. It’s somewhat time intensive to make, but truly worth it. If you don’t decorate it, it looks a little bland so I do suggest placing some little eatable flowers on top or something else to make it look a bit more appealing. I have doubled this recipe and used a 13X9 Pyrex dish; it worked out just fine but I did bake it somewhere between 45 to 60 minutes. Remember, I am in altitude so for your first baking it’s a watch and see mode. HINT: Poach the pears first; then do the custard; then make your crust; then put the whole deal together and bake; then cool. Told you it’s a bit time intensive but believe me it’s worth it. 6 (or more) UNPEELED Bartlet pears, halved, cored and sliced into half-inch slices. The pears can be semi-ripe but not mushy! Poach 4 of the pears according to my recipe on this blog. Use the method on top of the stove and I did put in currents. Save the extra 2 sliced unpeeled and un-poached pears for the last topping to go on top of the poached pears before you pour the chocolate custard sauce over all. Also, what I did was to buy extra pears and I poached them as well. So, when I served the tart, I also served a separate bowl of poached pears for those who are gluten intolerant. Of course I also served my no-churn homemade ice cream. YUM!!!!! Mix some sugar and cinnamon together to sprinkle on the extra 2 pears you will be placing on top of the poached pears before you pour the chocolate custard sauce over all. Combine the butter and chocolate in a small saucepan over low hear, stirring until totally melted. Sir in the milk, almond and salt. Set aside. Combine the egg, yolk, sugar, flour and cocoa powder in the food processor or mixer bowl and process for about 2 minutes. Pour in the milk and chocolate mixture and continue to process until smooth and completely incorporated. Set aside for a bit. 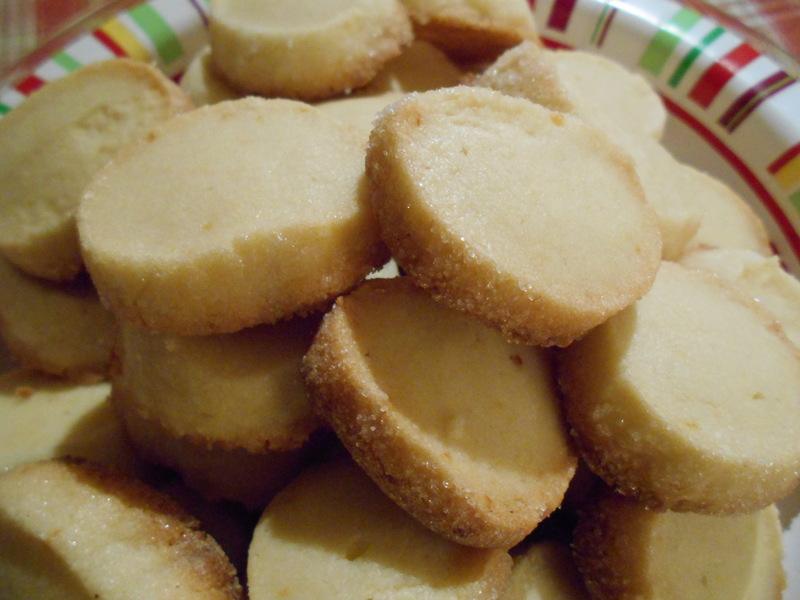 Place shortbread cookies in food processor and process until finely ground. Add the egg, melted butter, flour, sugar, salt and extract and process again until a soft, buttery dough forms. Remove dough, roll into a ball, wrap in plastic and chill in frig. for 20 minutes. Press the chilled dough into a greased 13” by 4” or a 9” round tart pan and score all over with a fork. 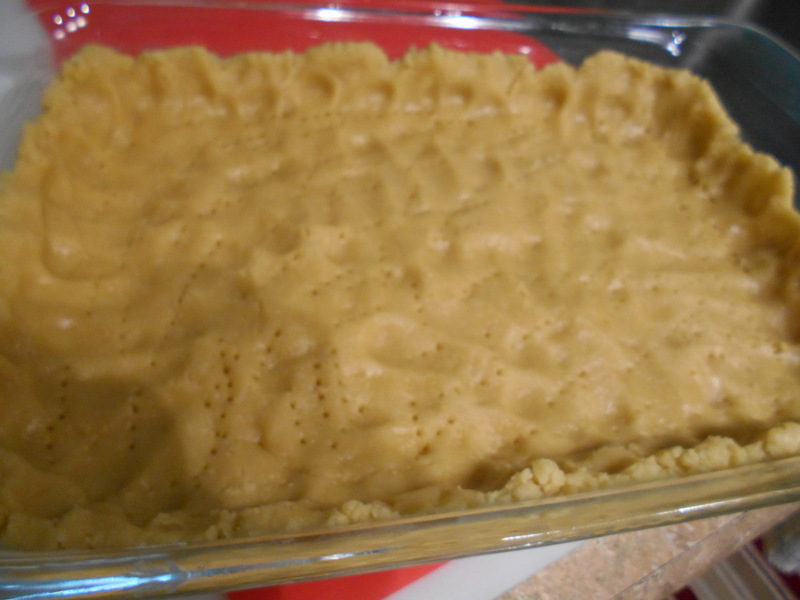 Place tart pan on a cookie sheet and blind bake in the oven for 7 minutes. Now you can place the poached pears on top of the crust and after you have done that, place the last 2 sliced unpeeled pears skin side up in a nice pattern. Sprinkle those with a bit of your mixed cinnamon/sugar. Pour the custard over all. Bake in your still heated 350 degree oven on the cookie sheet for 25 minutes or till the custard is set, firm and the crust is slightly golden.